Due to the amount of new content to check out and the disproportionately small amount of free time I have had available, this review is a little bit later than I had hoped for. No surprise there, I guess. However, I do hope it does not spoil your enjoyment of what you may find out in the next few pages. Here is a brief overview of what it is about and what I will be covering. 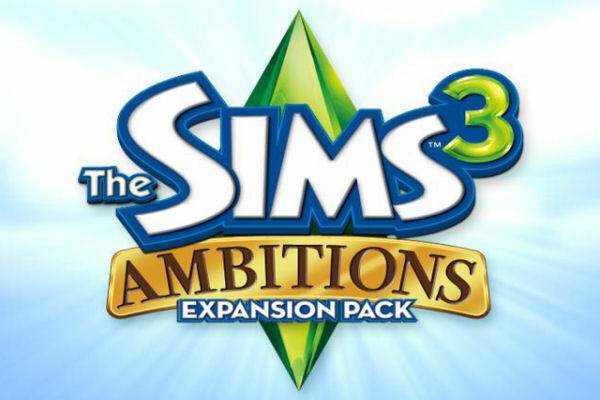 The Sims 3 Ambitions (AMB) adds a new career track, overhauls an existing one to make it more in line with the new playable professions that are also being introduced. 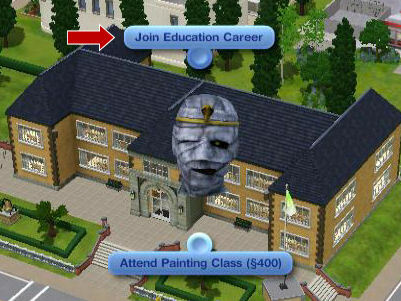 It also allows sims to become self-employed and build a career based on their creative skill set. There are new features for selling home-created items, sims can now get to do their own laundry or even go out and get a tattoo. That's just some of it. Please read on. To get straight to the meat of this expansion, it is all about new professions. This term is used in order to differentiate between the existing career tracks where you can see your sims go to work and apart from setting the tone of how they are going to work, there is not a lot else you can do. With these new professions, your sims either work away from the rabbit holes or even have a rabbit hole that we can go inside and directly influence their actions. While a sim is "on the clock", they could even pop to the nearest diner to get some lunch without their work performance being penalised. In certain cases, they can even make their own meals inside their workplace. For those who like the existing career pattern and are not quite ready to handle making all of the decisions for your sims, the Education Career has been added. This is based at the school and tones can be set as it has been in the existing careers that have come with the game so far. For those who might want to take a first step towards finding whether it works for them, the medicine career now been fused somewhat with the professions track. Your sim medic can be called out of the hospital for free clinics, outreach programs and even be called on to examine sims who have fallen ill even when your sim wants a night off and to have gone for a meal at the bistro. All of the new professions get a weekly stipend from city hall, which varies depending upon the profession and how high the sim has got in it. Each new profession has jobs that turn up in a manner not dissimilar to opportunities. In some cases, they are based in the habitable workplace especially with that of low-level stylist. A sim can accept, turn down or even ignore them. However, they will not get far in the profession if they just do the latter. When they accept them, it is down to how they are played on whether they get the job done. Once the job is done, there is a cash reward. Again, the higher the rank in the profession, the higher the level of the reward. There is also a chance of getting a bonus if they have done it really well. Professional Advancement is achieved from experience and this is gained from doing jobs, working on appropriate skills and various profession-specific metrics. For instance, ghost hunting requires logic, firefighting requires handiness and athletic skills. A sim could find themselves being promoted when they are not "on the clock" because they have been improving their skills at home and this experience has helped them reach the next level. They do not have to turn into work to have it happen, which is a good thing. From the existing careers, I have found it to be quite annoying to have a sim go into work with a 95% completed career progress meter but still have to get them to put in a full day to get the promotion when the bar would have been filled well before lunchtime. Yes, they get the promotion at the end of their shift but none of the work completed since the meter was topped will be carried forward. With the new profession system, you can get that promotion even in the middle of the night and any continued work carries on immediately. 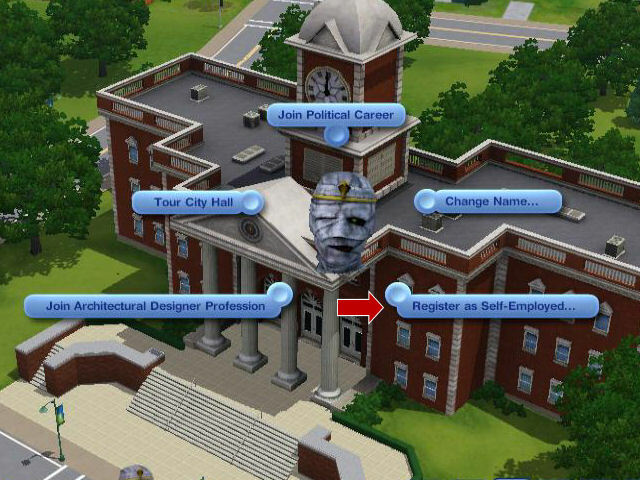 In previous simcarnations, when sims tried to make a living for themselves, they were just classed as "Unemployed". Personally, I thought a sim deserved a bit more respect from City Hall as they were providing income for the city and not needing the carpool to take them to work. Now, a sim with a suitable skill can go to City Hall and declare themselves to be self-employed with whatever worthwhile skill they have. Directly applicable to this expansion pack, this includes Sculptor and Inventor. On a very positive note, this does not just apply to the new skills. Sims can be self-employed as Writers, Painters, Gardeners, Fishermen (or women), Inventors or even - if the WA expansion pack is also installed - Nectar Makers or Photographers. Self-employed career advancement is achieved by the value of what they produce and sell. Advancement in these self-employed professions is simply achieved from the value of sales of produce appropriate to that skill. For example, your self-employed artist has just painted a picture to the value of Â§300. If they sold it immediately, it would count towards their career advancement. However, if they sold their easel as well, which also is worth Â§300, that would NOT count towards career advancement. Note - Although it might seem like a good idea at the time and unless it has been fixed in a patch since I have written this, taking stuff to the Consignment Store (see later about these) to be sold does not seem to count towards advancement in these skill-based careers. Written at 02:41 on Wednesday 21 July 2010 by Andy.